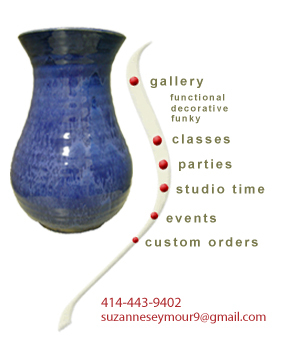 Sue is a self-taught artist who has been working in ceramic techniques for ten years. She has 14 years experience in working with children and holds an Associate Degree in Child Care and Development from MATC. Sue’s artwork has been exhibited and sold at numerous juried art fairs throughout the state of Wisconsin. Wendy is a self-taught artist who has been working in ceramics for the past year. She has a BSE in Occupational Safety and Health from the University of Wisconsin-Whitewater. A former Whitewater Tennis Player and Tennis Camp Instructor, Wendy enjoys working with students, creating hand-built art and customer interaction. Tiffany is an artist and Registered Art Therapist. She holds a B.F.A in sculpture from St. Mary’s College, Notre Dame, Indiana and an MS in Art Therapy from Mount Mary College in Milwaukee. Tiffany has been teaching art and ceramics to children and adults for the past 15 years. Tiffany’s artwork has been shown at Mount Mary College, the Cedarburg Cultural Center, the Andersen Arts Center and Spectrum Gallery.